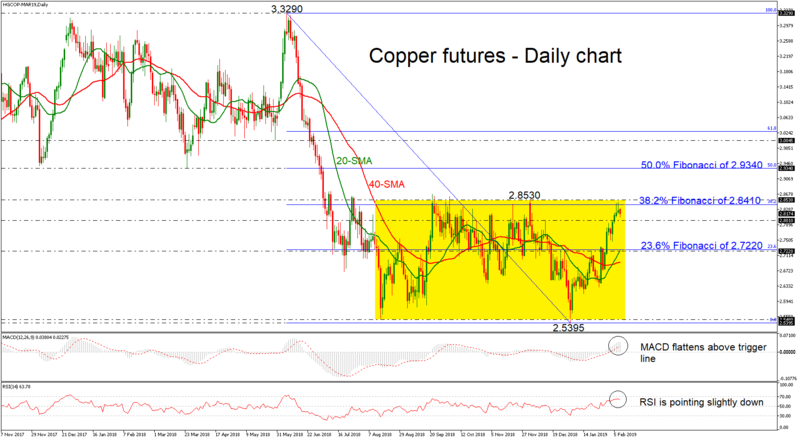 Copper futures with delivery in March 2019 have been moving in a sideways channel over the last six months with an upper boundary the 2.8530 resistance level and lower boundary the 2.5480 support. Currently, the price is easing below the 38.2% Fibonacci retracement level of the downleg from 3.3290 to 2.5480 around 2.8410, having rallied strongly so far in February. The technical indicators are still located in bullish area, with the MACD flattening above its red signal line, while the RSI is losing momentum above the 50 level. In case the price continues the downside pullback, the next immediate support is coming from the 2.8010 area. A penetration of this line would drive prices towards the 23.6% Fibonacci mark, which stands around the 20-day simple moving average (SMA). Alternatively, in case of a bounce up, the price could reach the upper boundary of the channel, however, the price needs first to successfully surpass the 38.2% Fibonacci. Above this area, the market may erase the consolidation area and send prices higher until the 50.0% Fibonacci of 2.9340. Summarizing, copper prices maintain neutral bias in medium-term picture, while in the longer timeframe, the market remains in a negative structure.